In my last post I mentioned an upcoming self-assignment trip to Arizona. Back in October of 2011 when I relaunched this blog I made the conscious decision to start taking photographs for myself. With that in mind, I began researching various photography workshops and came to some realizations. First, they fill up quickly which means you have to book early and with my current or potential assignment schedule, that is not always possible. Secondly, they can be expensive, usually somewhere in the $1000.00 to $2,000 price range. I'm not saying the price isn't worth it, in fact sometimes I wonder how they get the workshop leaders they do for that price. Remember, with some exceptions, the workshop price does not include transportation, meals or lodging. Taking all that into consideration, I decided that I would put together my own photographic adventure. So next week I'm headed to Arizona with plans to visit the Grand Canyon, Antelope Canyon, Monument Valley, The Painted Desert, and whatever else I come across in a week's time. Why Arizona? Sometimes things just come together and that is the case here. I was on Google + and saw a post from R.C. Concepcion about a Red Rock Adventure trip he was on as part of Bill Fortney's His Light Workshops. This was actually one of the workshops I had considered after having talked with Bill during PhotoPlus in 2011 and really admiring his art and passion. However, as I mentioned above, timing was not on my side, but at $499, the price was incredibly reasonable. RCs post started me thinking, but then I saw a Google + post from Matt Kloskowski, another Photoshop Guy, talking about the same trip and that led me to his blog post titled What I Learned on My First Star Photo Shoot about his experience shooting at night in Monument Valley. Now I really started thinking. Next step of course was to open Google Maps and figure out the relationships between these locations in terms of distance. And didn't I have friends in Phoenix that I've been promising to visit for years? 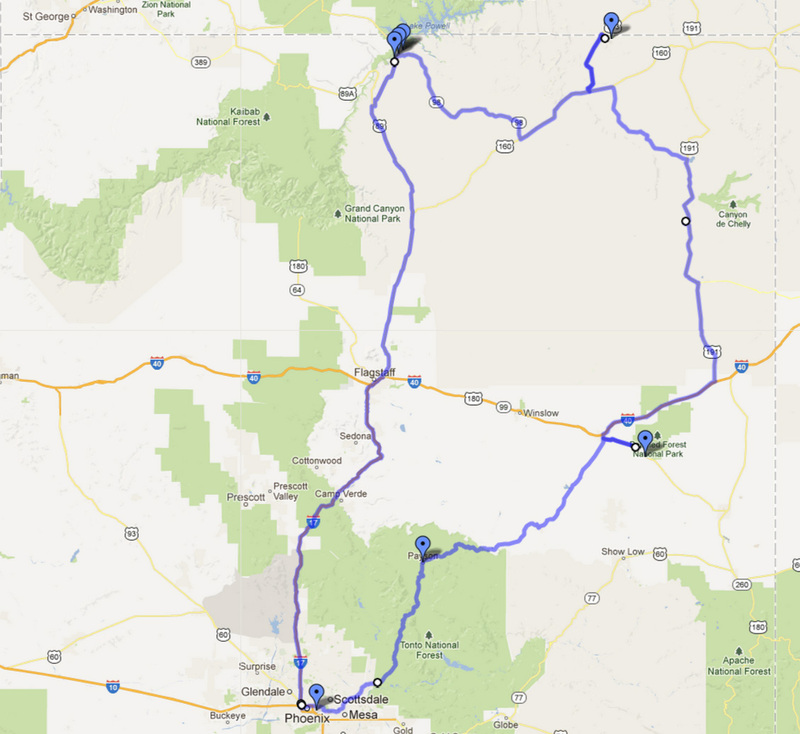 I thought about all this for a night and the next day started to run the numbers for hotels, flights, rental car, access (some of these locations are on Navajo land which require guides), etc., and realized that I could do this at a reasonable cost, probably the whole trip for around $1000. I also had enough frequent flier miles to cover airfare and because of the time of year, many hotel rates are lower. With the decision made, I began to line things up. I picked the dates and secured the time off from work. Called Phoenix friends and asked if I could spend first night in with them. Next step was to book two nights at the Monument Valley Inn where all the rooms have balconies with a view of the valley and based on recommendations from Matt, I secured a top floor room with no overhang. Finished off my hotel bookings with one night in Page, Ariz., and the final night in Payson, Ariz., leaving me close to Phoenix the night before I return. Sent email and made the arrangements with Antelope Canyon Tours to take me to Antelope Canyon. With the itinerary complete, the only thing left for me to do is find the motivation to get up early and stay up late. This is one downside to not participating in a workshop; the other is missing out on the camaraderie. But I don't think I will be alone in these spots and I'm sure I'll meet other photographers. Besides, being on my own will give me some flexibility in schedule and the option to explore or discover other things along the way. Next post will be about packing for this trip, then I plan to update this blog each day of the trip, with a final post about the whole experience. Additionally, I will be posting some photos and other updates to my Google Plus, Flickr, Facebook and 500px accounts.